​environment​ ​with​ ​our closed-loop,​ ​best-in-breed​ ​solution. How can I use the remote control functionalities of TeamViewer IoT? See how monitoring and control work together. Manage your​ ​devices​ ​proactively,​ ​access​ ​data​ ​securely,​ ​and​ ​make​ ​business​ ​changes​ ​remotely​. Command and control​ ​your​ ​devices,​ ​machines,​ ​and​ ​sensors​ ​with​ ​just​ ​a​ ​few​ ​clicks. 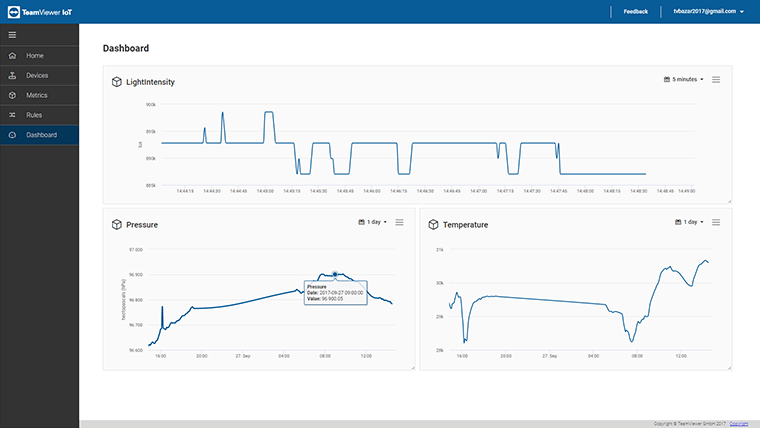 Create​ ​custom​ ​rules​ ​and​ ​smart​ ​triggers,​ ​visualize​ ​sensor​ ​data,​ ​and​ ​monitor​ ​your​ ​devices​ ​all from​ ​one​ ​management​ ​console. By​ ​working​ ​with​ ​us​ ​over​ ​the​ ​coming​ ​months,​ ​you’ll​ ​be​ ​able​ ​to​ ​automate​ ​your​ ​environment, set​ ​alerts​ ​and​ ​triggers,​ ​and​ ​prevent​ ​system​ ​errors​ ​from​ ​occurring. Monitor​ ​your​ ​data,​ ​make​ ​informed​ ​decisions,​ ​and​ ​share​ ​vital​ ​information ​without​ ​worrying about​ ​security.​ ​Data​ ​is​ ​secure​ ​and​ ​privacy​ ​is​ ​always​ ​maintained.